As any seasoned coffee drinker can attest, brewing a quality cup of coffee involves more than just buying the most expensive bag of beans from your local supermarket. 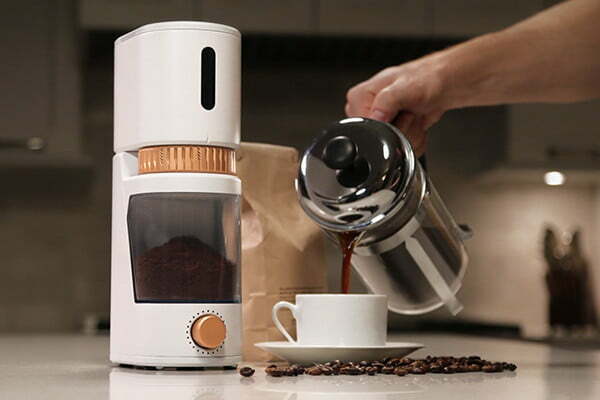 Understanding the act of brewing coffee to be equal parts art and science, a New York-based startup called Get It Right has taken to Kickstarter to launch a smart coffee grinder called Voltaire. Designed to give coffee lovers the ability to craft espresso-shop-level java from the comfort of their own homes, Voltaire monitors the freshness of ground beans, orders replacement coffee, and excels at grinding coffee. Though it may seem a bit excessive on its face, Get It Right’s Voltaire coffee grinder is java brewing innovation you never knew you needed. In addition to its freshness-sensing technology and ability to order more coffee when beans go stale, the device also boasts a compatible smartphone application allowing users to keep tabs on their coffee even while away. For instance, if a batch of ground beans starts to get low, users can choose to replace their coffee via the app itself or set it up to auto-replenish on its own. Voltaire’s usefulness truly shines with its built-in LiFePO4 batteries which tout the capability of grinding roughly three pounds of beans before requiring another charge. Moreover, a fully charged Voltaire also maintains battery life for over three weeks, meaning you could even take it camping with you without worrying about a lack of electricity. Get It Right also offers a smart-free version of the grinder that’s a bit more cost effective and doesn’t feature the original’s sensing technology — but remains just as portable and capable of grinding quality coffee. “We wanted to try and take the quality you’d get from those huge professional grinders and give it to you in a beautiful single package that you could have at home,” said Get It Right’s director of design, Mike Egan. Under the hood, the Voltaire makes use of an innovative conical burr design, a stepless adjustment wheel allowing users to fine tune their grinds, as well as programmable presets which remember exact grind settings. These features coupled with Voltaire’s sensing technology make it an appealing addition to any java lover’s brew arsenal. As of this writing, the Kickstarter campaign has 56 days remaining and has raised nearly $40,000 of its $100,000 goal.